Tortilis Camp is an award-winning luxury tented camp in Amboseli National Park. 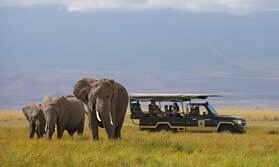 Amboseli is best known for unrivalled views of Kilimanjaro and its huge elephant population. Tortilis Camp is just outside the park in Kitirua Conservancy, one of Amboseli's few remaining areas of unspoilt woodland. Tortilis Camp has 16 spacious tents, all with elegant en-suite bathrooms with hot showers and flush toilets. Tents are set on raised wooden decks and sheltered by a makuti-thatched roof. The large veranda is ideal for an early afternoon siesta. There is also a family tent, with 2 en-suite bedrooms. Further accommodation is provided by the private house which also has 2 en-suite bedrooms plus a sitting-dining area and a veranda. The private house shares a pool with the family tent. The main building houses a lounge, bar and dining area, all with magnificent view of Kilimanjaro. Tortilis has a large organic vegetable garden and serves tasty home-made salads, vegetables, freshly made pasta and baked breads. Bush meals and sundowners are popular. During the day, you can take game drives in an open 4x4 vehicle or go for a guided walk outside the park with one of the expert Maasai guides. The camp is happy to arrange visits to local villages. After a busy day, take it easy on your veranda enjoying the views, chat over a drink in the bar or take a cooling dip in the swimming pool. Open: Tortilis Camp is open all year. Location: Tortilis Camp is on the 30,000 acre Kitirua private game concession on the western edge of Amboseli National Park. From camp there are dramatic views of Mount Kilimanjaro. The camp is a 45 minute drive from Amboseli airstrip. Rooms: The 16 tents are spacious and have twin or double beds and en-suite bathrooms. An extra bed can be added for a child under 16. There is also a family tent with 2 bedrooms and 2 bathrooms. All tents have large verandas with a table and chairs. There is additional accommodation in the private house, which has double and twin bedrooms and 2 bathrooms, a roomy sitting and dining area and a veranda. Camera batteries can be charged in tents. Activities: The camp provides game drives in the national park and in the private concession, nature walks with Masai guides, bush breakfasts and sundowners. You can visit Masai homesteads. In camp you can swim in the pool, sunbathe on the deck, relax with a massage and enjoy a drink at the bar. Facilities: There is a main lounge, bar and dining area, all under thatched roofs and with great views of Mount Kilimanjaro. The swimming pool is shaded by palms and acacia trees, perfect for a cooling swim. There is bar service and board games are available. The camp has a vegetable garden and serves home-grown salads and vegetables with every meal. As well as breakfast, lunch and dinner, the camp serves afternoon tea with home-made cakes and biscuits plus canapes and nibbles before dinner. The spa offers massages, manicures and pedicures. Children: Children of all ages are welcome. Special meals can be prepared for children and babysitting can be arranged. Health: Malaria protection is advised. Communication: There is Wi-Fi internet access in most tents, though this may be slow. More than 60% of Tortilis's staff come from the local community and are trained at the camp. Tortilis Camp leases 30,000 acres from the local community creating the 'Kitirua Conservancy'. This benefits the local community and helps preserve an important part of the Amboseli eco-system. Tortilis has contributed funds to build Esiteti Primary School, which opened in August 2011 and continues to support the school in its development. The camp supports the African Conservation Centre in its rangeland rehabilitation research project. "Great accommodation... but very little game to be seen...Not the right time of year for Amboseli...."
"This camp was lovely. It has hints of luxury throughout but it keeps the African feel very well. The view over the waterhole is great and the staff and managers were friendly and very helpful. This camp not for young children, and is for someone looking for a luxury, peaceful and quality experience."